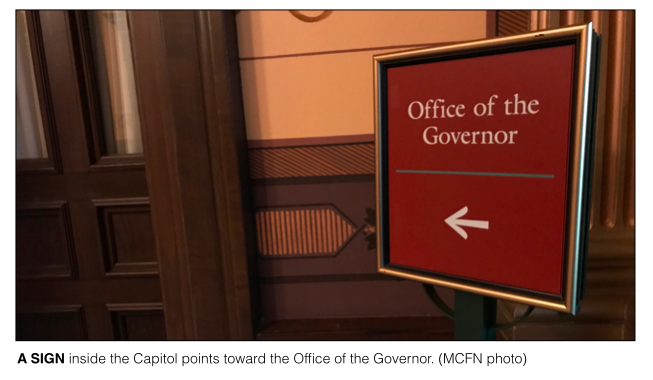 LANSING — While they’re still a year away from collecting official votes for governor, a field of potential candidates in Michigan has already amassed more than $7.5 million in campaign cash. Six candidates officially running to be the state’s next governor and two potential candidates reported in fundraising disclosures due today that combined, they had $7.5 million sitting in accounts on July 20, all of it money that could be used for gubernatorial campaigns. The candidates and potential candidates reported raising a similar amount, $7.5 million, over the first seven months of 2017. 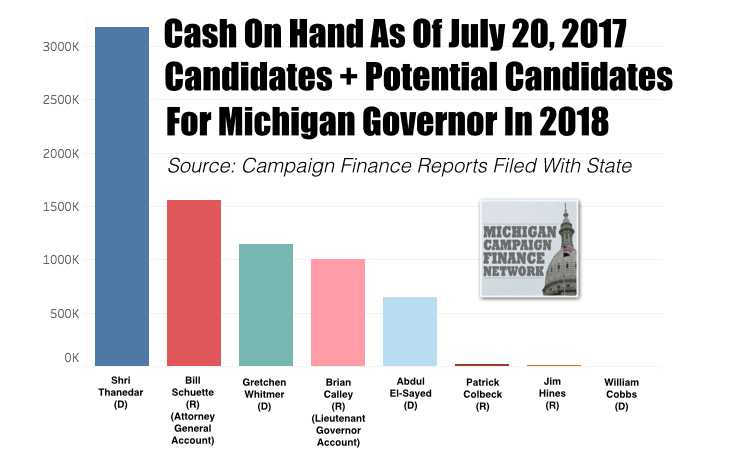 It’s a significant amount of cash compared to past gubernatorial races in Michigan. The last time the job of Michigan governor was open with no incumbent to run was 2010. The candidates in the Democratic and Republican primaries in 2010 combined to raise about $16 million — not including public funding provided to the campaigns. The 2016 field could be nearly halfway to that total, and the primary is still a year away. For the 2014 race, Democratic candidate Mark Schauer, who unsuccessfully challenged GOP incumbent Gov. Rick Snyder, had raised $1.6 million by the end of 2013. This time around, three Democrats are already above the $1-million mark in July of the off-year. The following is a summary of the latest fundraising reports of the gubernatorial candidates and potential candidates. The summary includes information on where some of the money came from. Whitmer, the former minority leader of the Michigan Senate, has already received 9,303 individual contributions, according to her new filing. More than 6,700 of them were of amounts less than $100. But she’s had some large contributions as well: Emily’s List, a group that supports "pro-choice Democratic women," according to its website, gave $66,000; and the Michigan State Utility Workers PAC gave $64,000. Whitmer’s own political action committee (PAC) gave $51,000. As of July 20, Whitmer’s campaign reported $1.1 million cash on hand, meaning the money was available to be spent. Abdul El-Sayed, the former director of the Detroit Health Department, also crossed the $1-million fundraising mark. El-Sayed’s campaign reported $1.01 million in direct contributions and $16,907 in in-kind contributions. El-Sayed’s campaign reported more than 3,700 individual contributions. Of those, 2,110 were of amounts less than $100. Twenty-six were maximum contributions of $6,800. El-Sayed reported about $409,000 in contributions from donors who listed out-of-state addresses. The campaign had spent $373,456 through July 20. It spent most heavily on payroll and campaign consulting. Hines, a physician from Saginaw, launched his fundraising committee in February 2016. In 2017, he’s raised $234,358. For the entirety of his campaign, he’s raised $429,640. Hines himself has been his top funder, providing $388,524 in support for his campaign. According to his new filing, he’s paid $123,749 to a firm to help gather signatures needed to get himself on the ballot in 2018. Colbeck, a conservative state senator from Canton, formed his committee for governor at the of May. So he had less than two months to raise money before the filing deadline today. In those months, he reported raising $61,486 in contributions from 202 individual contributions. Eugene and Sonia Jurkiw, of Rochester Hills, were his largest supporters, giving $13,600. Schuette, the term-limited attorney general, has been raising lots of money although he can’t run for another term as attorney general. He’s expected to run for governor but he hasn’t made an official announcement yet. In the meantime, he can raise money for his attorney general committee. That money could later be transferred to his gubernatorial campaign. Schuette reported raising $905,240 so far in 2017 with a stockpile of $1.5 million in the account on July 20. Schuette disclosed 1,428 individual contributions so far in 2017. Among the top donors were DTE Energy’s PAC, which gave $15,000, and the Michigan Beer and Wine Wholesalers Association PAC, which gave $9,750. A handful of major Michigan political donors also chipped in for Schuette including Roger Penske, who gave $6,800, Farhat Qazi, who gave $6,800, and Pamella DeVos, who gave $1,000. Total Contributions In 2017 To Lieutenant Governor Committee: $478,227. Like Schuette, Calley hasn’t announced he’s running for governor but has been raising money. Calley reported raising $478,227 so far in 2017 for his lieutenant governor account. Money in that account could be used for a gubernatorial campaign in the future. As of July 20, Calley reported $1.0 million in the account waiting to be spent. His top donors this year include the Michigan Chamber PAC, which gave $10,000, and the Michigan Beer and Wine Wholesalers Association PAC, which gave $8,350. William and Barb Parfet, who were heavy supporters of Gov. Rick Snyder’s campaigns, gave $6,800 each.